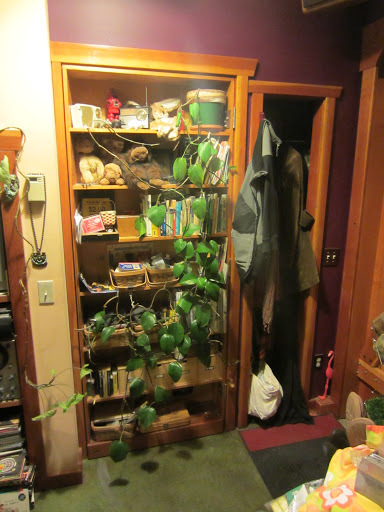 A Secret Door in A Small Seattle House! While sifting through, oh, a few hundred photos I hadn’t posted yet, I now have the urge to incorporate a hidden passageway into the cabin we’re all collectively building in North Carolina at our 3-day Tiny House Workshop- seriously, we just may have to do it! The workshop is April 26th-28th….CLICK HERE for more info…. I LOVE, LOVE, LOVE secret passageways. 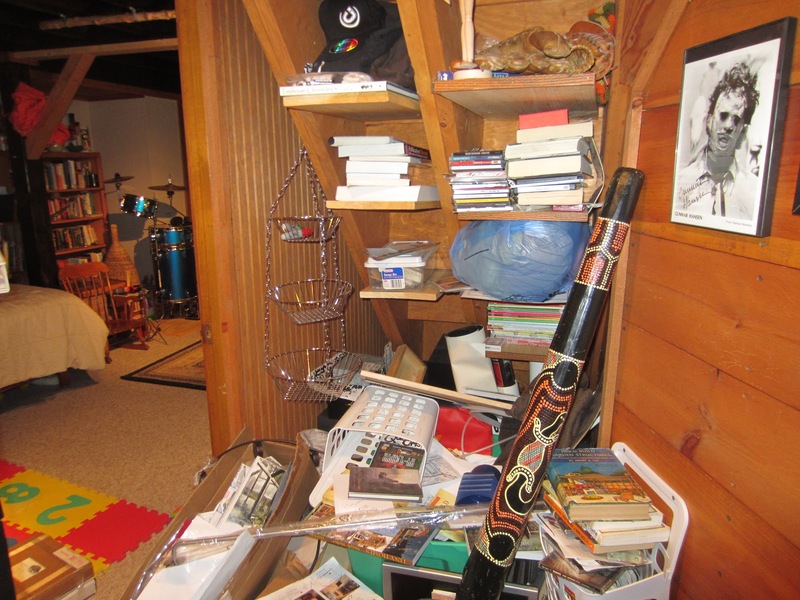 Perhaps it was infused in me from movies like “The Goonies” when I was a kid, or the TV show “Webster” (if anyone remembers that), but I just can’t resist clicking on links, videos, articles, and tours of homes with secret passages….. SO…..I was thrilled to come across one face to face while filming episode of my show “Tiny Yellow House” out in Seattle earlier this year (with Christopher Smith, one of the two (with Merete Mueller) behind the much anticipated “Tiny: The Movie“). 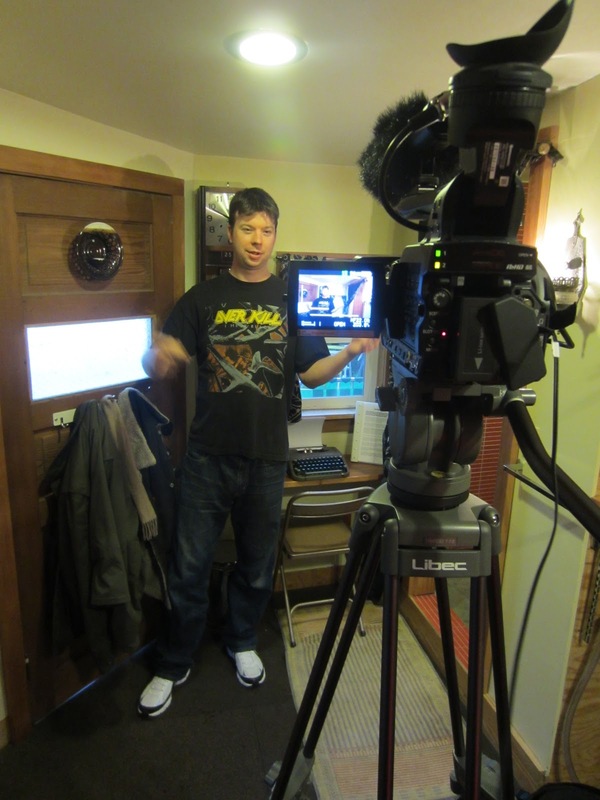 You might have seen my video tour of Hal Colombo’s 68 square foot tiny guest house (complete with a mechanical, garage-door murphy bed!) this past summer, but Hal’s main house itself was actually twice as wild! Sadly, we didn’t have time to film it, but I hope to return at some point- it was just TOO good of a time. The old video is below- and check out this secret Scooby-Doo-like bathroom door. This bookcase is SOLID, and hung on massive hinges, yet it swings with ease! The big ole hinges are the giveaway, but its really well designed, and the door gives way to an under-the-staircase bathroom. 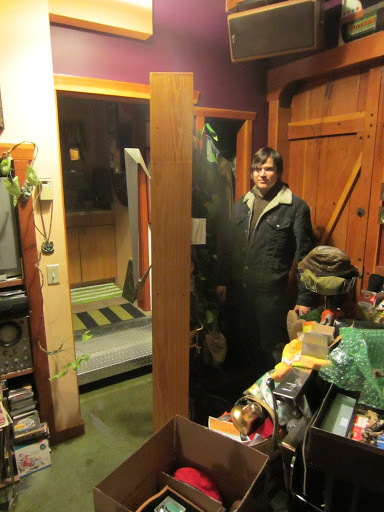 Hal’s home, overall, is about 600 or so square feet, from what I remember him telling me. As for the guest house, YES, you can rent it by the night- over on airbnb.com. Hal also plays in a really cool surf/garage rock band called “The Vacant Stairs”. Funky Junk! I love it! 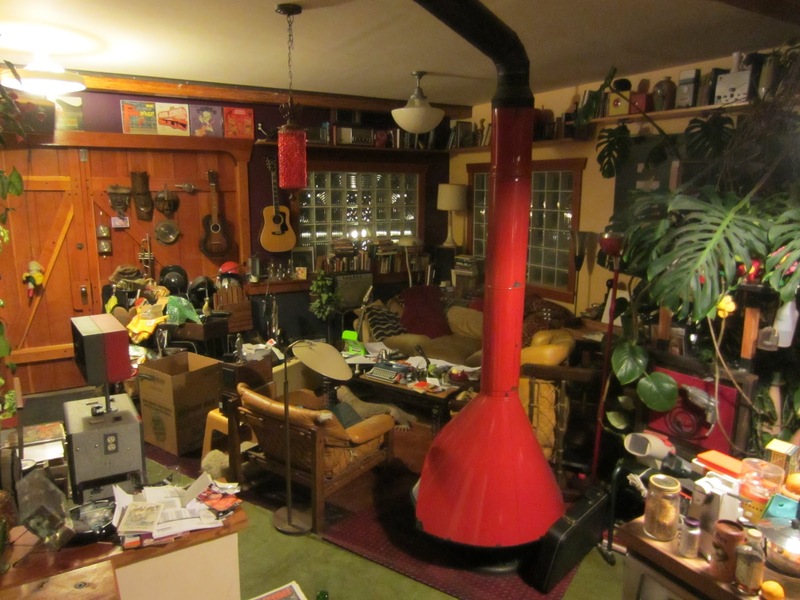 You could spend a few hours in his living room looking around and never unearth, or ask about, all that you wanted to know and see. Filming the show, at like 6am (after that hellish flight), BEFORE heading off to speak at the Tumbleweed Tiny House Workshop. IF YOU MISSED THE VIDEO TOUR…. "The Darrington Cabin" Mock Ups- A Tiny Guest House/Office…. 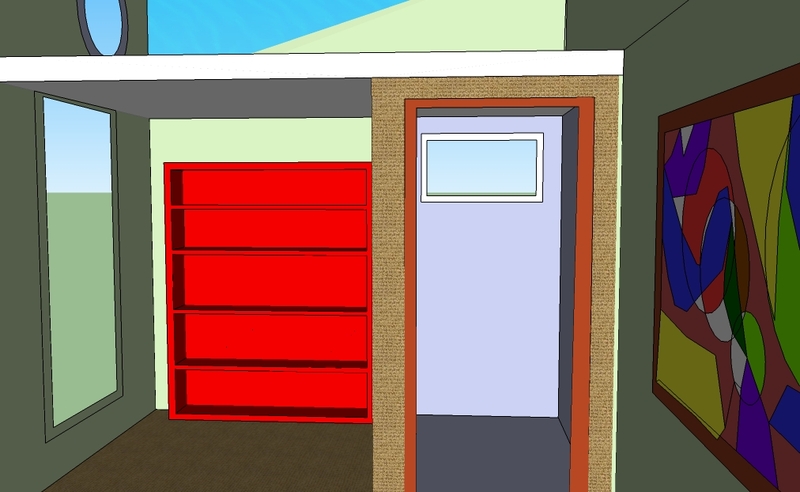 Here’s another stab at the cabin design we might be tinkering with (well, ACTUALLY BUILDING!) 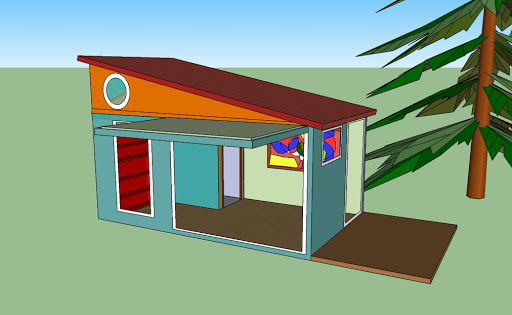 at our April 26th-28th Tiny House Building Workshop in Wilmington, NC. THREE DAYS of building, designing, networking, guest speakers, demos, and MORE! CLICK HERE if you might want to sign up….while we still have space. Its limited to 25 people total. The list of guest speakers is GREAT too- with MORE to come! Steven Harrell of Tinyhouselistings.com, Kent Griswold of Tinyhouseblog.com, Alex Pino of Tinyhousetalk.com, Laura LaVoie of 120squarefeet.com, AND MORE- they’ll all be there as speakers! I’ve never really messed around with Google Sketch-up before, just because I haven’t had the chance, so with a little block of time today I decided to mess around a bit, with some off-shoot ideas (and there will be many other to come) for a micro-cabin I’ll eventually be building, that I’ve named “The Darrington” (a combination of “Deek” and “Harrington” (a nod to Kevin Harrington of www.COZYHOMEPLANS.com, who has been so helpful with my videos, and blog. 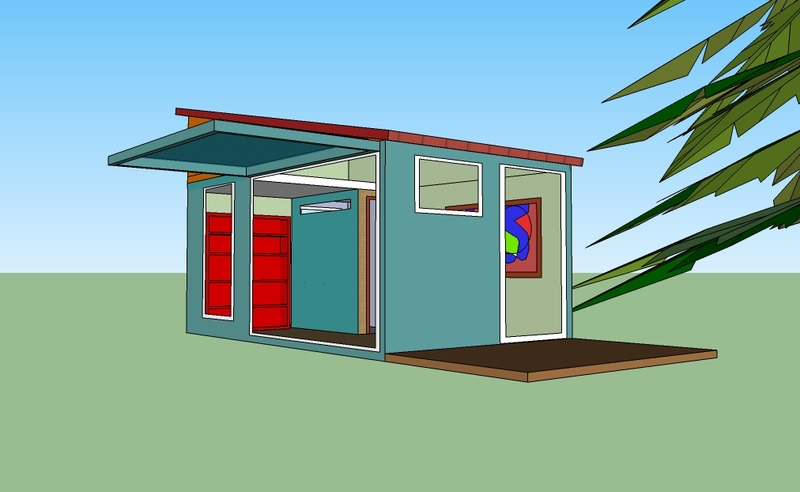 The cabin is 8′ by 12′, and 10′ tall at its highest point, and what you see here is a mere rough draft. Again, these sketch-ups are pretty darn rough, as, well, I’ve used the program for about a total of 2 hours and that’s it. I DO see how people can get addicted though, and heck, its a free program! No complaints here. In the photo above, the closet makeover is not 100% complete, but its getting there. The new space acts as a little reading/play nook for my kids, which they love- its very fort-like, and if I have to do any computer work while at home, they’re inches behind me, so that I can keep an eye on them. 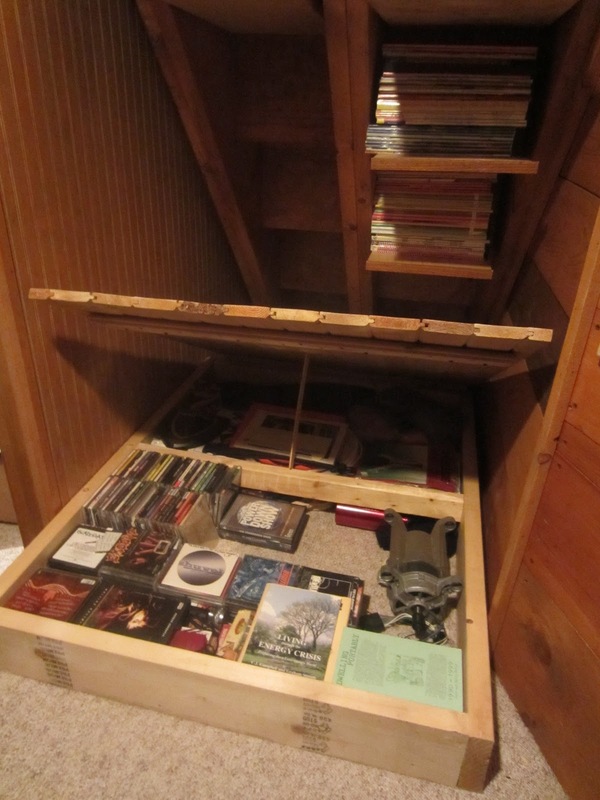 Basically, I utilized the under-stair shelving I had installed (on stairs I also had built a few years ago, the office too…) for storage of books, magazines, and future giveaway items for the blog, AND…..I built what I call “FLOORAGE”. 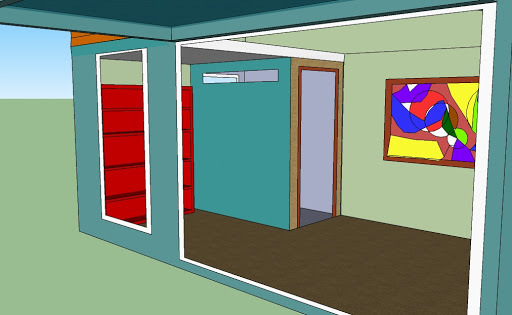 Floorage is the building of a thin, boxed, floor section, ON TOP of an existing floor. Its almost like building a stage, but one that is hollow, and opens up for access and storage within. Mine was made of a few 2by6’s and some left over tongue and groove cedar I had. 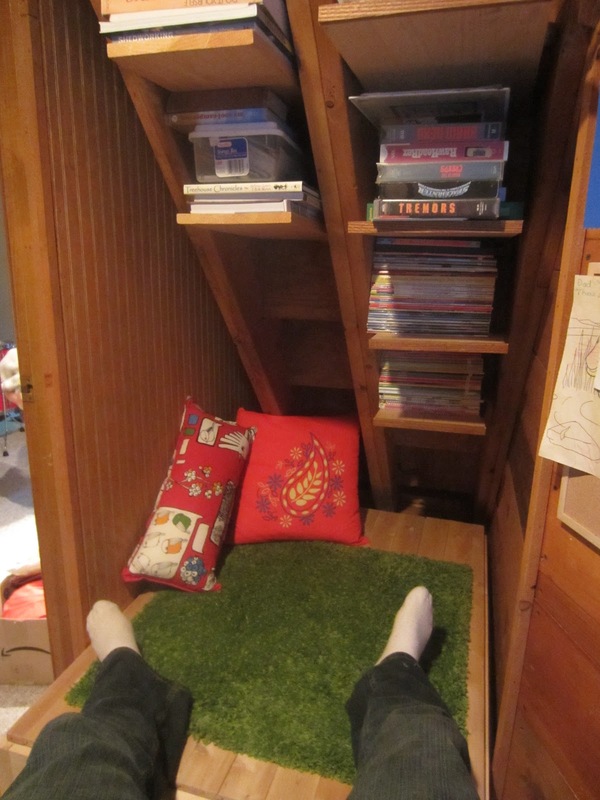 Slap an Ikea rug and a pillow or two on top of that, and Whammo!- a simple under-stair-office makeover! Naturally, some of the items I parted with, or moved elsewhere, but believe it or not, most everything fit in here, AND there’s a little room to spare… The edge of the storage/floorage box also has a nice stained/trim edge now, which isn’t shown in this photo. 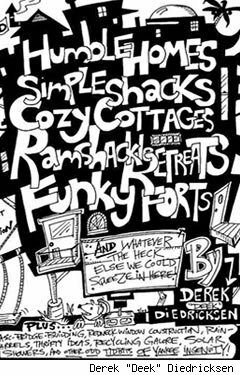 I talk about this a lil’ bit in my book “Humble Homes, Simple Shacks”, but will expand on more of these style ideas in the next book I’ve been working on…. Clever Salvage Siding for Sheds, Outhouses, n’ Cabins…. 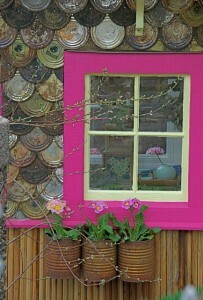 Suzanne St. Pierre and Scott’s Paint Can Lid Outhouse Siding….. Pretty simple…. a la flattened metal-juice can siding, which I’ve tried- it works well! Check Out Details on our HANDS-ON, TINY HOUSE BUILDING WORKSHOP in WILMINGTON, NC= April 26th-28th, 2013= CLICK HERE- build a tiny house, guest speakers, demos…. Super cool ICE FISHING SHACK/Shanty/Cabin Video! Wow! Check out this one- its FOLDABLE! Pretty darn clever…. Aside from Ice Fishing, these might be great for the homeless…. 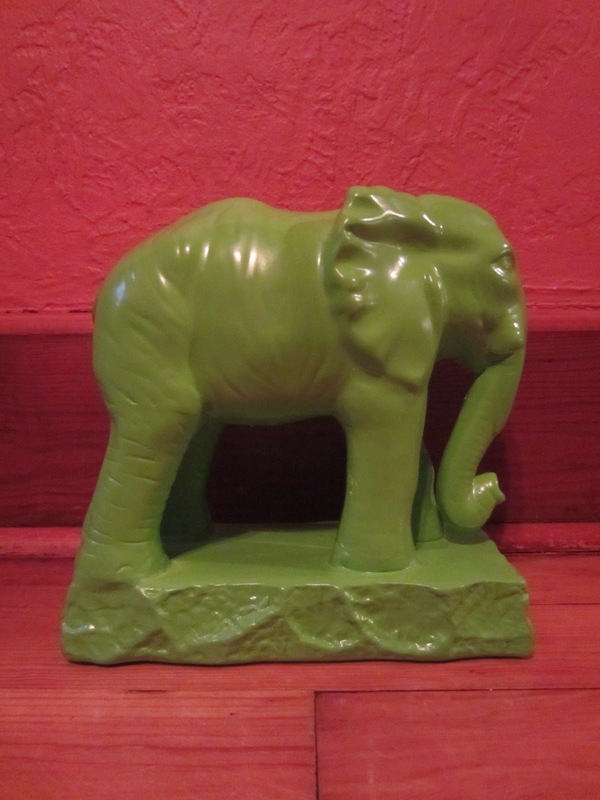 Found this the other day- a bright, lime-green elephant statue- about 10″ tall, and I just couldn’t pass it up. Why? Well, its so ugly n’ bizarre, that I find it interesting…. I believe “Fugly” could also be the term used (you figure it out…). Anyhow, this thing will be amongst the decorative mess of weirdness that I’ve slowly been arranging in my little cabin “The All Eights”- and just you wait to see some of the other things I’ve found curbside, at yard sales, and at occasional thrift shops. Here’s the lo-fi D.I.Y. rustic lantern video I shot in this tiny house/shed a ways back too, for those who have zero I as to what I’m talking about! As you can see, this place is far from done, and you can even see some uncut trim in the thumbnail shot of this structure. Upcoming- more guests will be announced for our Tiny House-Building Workshop in Wilmington, NC- April 26th-28th (2013)! THREE DAYS of Building a Tiny House Together! 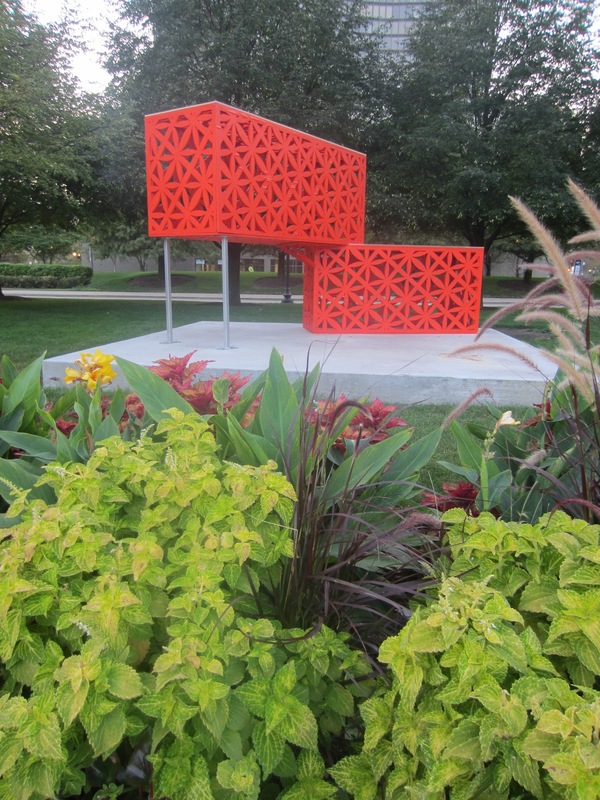 This will be limited to 25 attendees…..
As for these photos….I took these while out in Chicago when I was teaching another tiny house building workshop for the Tumbleweed Tiny House Company. The workshop was a ton of fun, great people all around, great feedback, and it also gave me a chance to wander around one of my favorite cities! I first visited Chicago in 1996 while touring the U.S. with a punk band, and I fell in love with that town instantly. The art, architecture, and food- its all amazing! This workshop was my 4th visit there, and I’d love to go back. 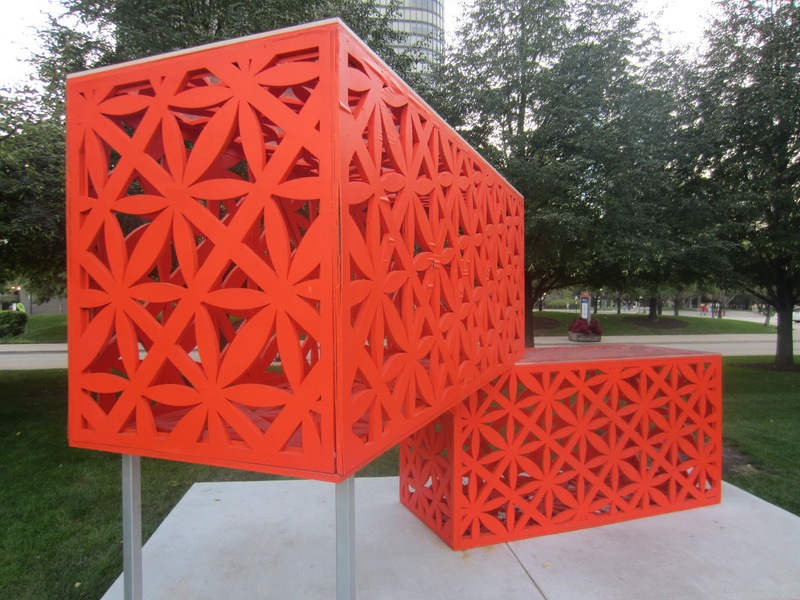 Shown here, is a sculpture near the Navy Pier, that, to me, sets up a very simple and clever arrangement for the building of a tiny shipping container, or “conex box”, home. These homes are becoming more and more popular, and entire books have even been devoted to their existence. 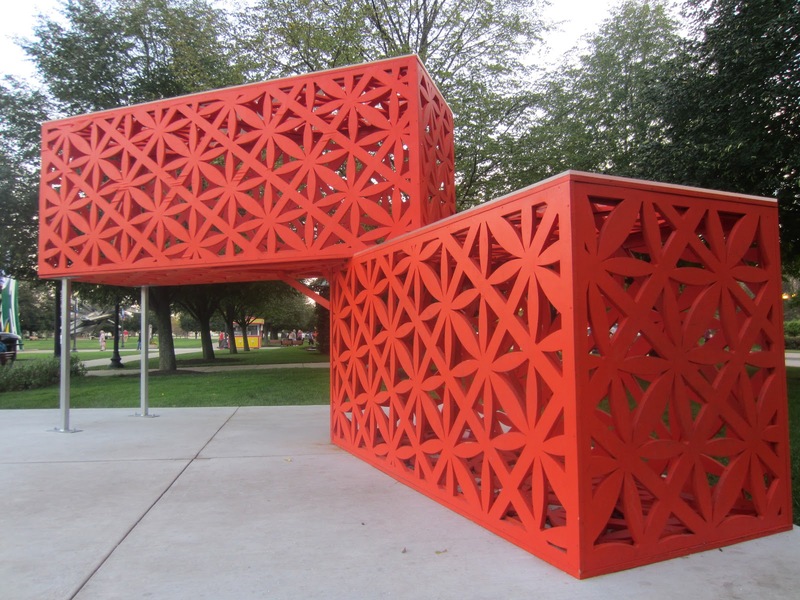 While these were mere 4′ by 8′ models made out of routed plywood, their arrangement provides for a connected second story, AND a shaded car port, or deck area, beneath. I like how they are stacked at an angle too- I feel it makes the set-up less boxy, and less predictable. These might also make for a great screened-in tree house/fort in the woods! 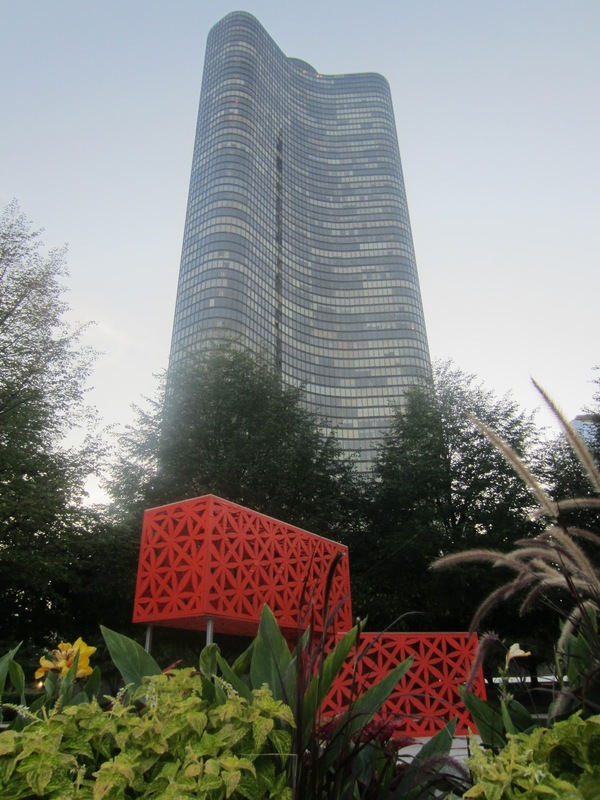 Imagine how great they would look while lit up at night! Like a giant ornamental candle!